The German passenger car manufacturer has rolled out the limited edition version of its trendy sedan, Vento. This new trim is christened as Volkswagen Vento Style Limited Edition and it is available on the mid range Comfortline platform. The company priced this vehicle slightly higher than the Comfortline variant and it comes with a signature chrome package. The company is offering this new edition with a set of new cosmetics in terms of both interiors and exteriors. The chrome package of this vehicle includes a Chrome front grille, “Style” badging on dashboard and exterior chrome highlights, other new aspects include stylish alloy wheels, doorstep garnish, and dual feel seat covers. These new aspects will add to the customers comforts and will help the company to improve its sales. The company is offering this limited edition trim with both petrol and diesel engine options. This trim is powered by the same 1.6-litre petrol engine, which is already prevalent in the existing variants of Vento. The company has blessed this particular variant with a lot of features including an automatic AC unit, multi-function display, 2-DIN music player and lots of other advanced features. The exterior style of this latest Volkswagen Vento Petrol Style Limited Edition looks much better with the signature chrome package. This new edition gets a lot of chrome accentuation all over its body, especially on its front and rear end. To begin with, the frontage of the vehicle gets the chrome radiator grille with company logo incorporated in it. While the rest of the front facade remains to be the same as existing “Comfortline” trim. The headlight cluster is very sleek and it houses a powerful halogen lamp along with turn indicator . Below the grille, there is a sporty bumper that is incorporated with a wide air dam as well as fog lights. The chin guard type of design on the bumper adds the sporty elements to the frontage. On the side profile, this limited edition trim gets the new set of alloy wheels that significantly improves the look of its side. The door handles and the ORVMs have been painted in the body color, while the window sills have been garnished in gloss black shade. Coming to the rear profile, you can notice the chrome highlights on the bumper that adds to the magnificent look of the vehicle. The taillight cluster is very sleek and the boot lid is stylish, which is further accentuated with chrome badges. The company also added the chrome inserts inside cabin on dashboard that enhances the premium look of interiors. Also there is a doorstep garnish with “Style” lettering that gives a distinct look to the vehicle. Another new aspect of this edition include the dual feel seat covers that gives a luxurious feel to the occupants inside. The cabin is blessed with dual tone beige and black color scheme that will create a plush environment inside. The dashboard is very stylish and it is fitted with an AC unit, music system, Instrument cluster and so on. The most impressive aspect about the interiors is its lavish leg space and shoulder room. The company is offering this limited edition trim with all the features that were incorporated to the “Comfortline” trim. Some of the utility based features include 3-grab handles above the doors with coat hooks, front center arm rest with cup holder for rear seat, rear doors with storage compartment, ashtray in front console, sunglass holder in glove box and lots more. Coming to the engine technicalities, the Volkswagen Vento Style Petrol Limited Edition trim comes equipped with a 1.6-litre, 4-cylinder, in-line petrol motor that can produce 1598cc displacement capacity. The company designed this engine with DOHC valve configuration and incorporated the MPFI fuel supply system that helps to produce a reliable performance. This in-line engine can generate a maximum 103.6bhp of power at 5250rpm while producing 153Nm of maximum torque at 3800rpm. The front wheels of this sedan draws the commanding engine torque through the 5-speed manual transmission gearbox. This will also help the vehicle to give away a peak mileage output in the range of 12 to 15 Kmpl, which is good. This vehicle takes only about 10.7 seconds to reach a speed mark of 100 Kmph and it can obtain a top speed of about 186 Kmph, which is remarkable. These are some of the most important aspects of any vehicle in the automobile segment. The German automobile company has fitted the front wheels with disc brakes and assembled the rear wheels with drum brakes. This is a highly proficient braking combination that provides a safe driving experience to the driver. On the other hand, its speed sensitive is the most impressive aspect that can help driver to steer the vehicle even at a very low speed. Handling the Volkswagen Vento is much easier because of its robust suspension system. The company fitted the front axle of this sedan with McPherson Strut type of suspension system accompanied with stabilizer bars while the rear axle comes fitted with semi-independent trailing arm. This will significantly improve the stability and agility of the vehicle on all road conditions. 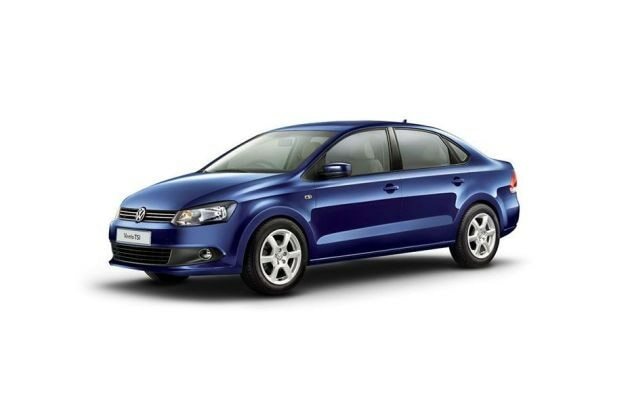 The new Volkswagen Vento Petrol Style Limited Edition trim is offered with a lengthy list of comfort features. The company retained all the features that are offered in the Comfortline variant. The list includes a Climatronic automatic air conditioning system, electrically adjustable outside rear view mirror, vanity mirror in left side sun blind, ticket holder in right side sun blind, front and rear power windows , central locking, fuel lid with push style opening, opening and closing of windows with remote key and lots more. The company is also offering this particular variant with a 2-DIN RCD 220 music system that has sockets for USB and AUX-In connectivity. The German automobile company is offering this limited edition trim with standard safety features. Those functions include pinch guard safety for all 4 power windows, fog lights, high mounted third brake lights , height adjustable headrest, internal rear view mirror and an advanced engine immobilizer system. Pros: Signature chrome package, improved style and exterior appearance. Cons: Standard protective functions, mileage can be better.